A YouTube subscriber asked me if I had a lesson on how to say “to get a ride” and “to give a ride” in Portuguese. Well, now I do 🙂 Here is my new video lesson. First, let me say that this lesson refers to free rides, such as when a coworker gives you a ride home or a friend gives you a ride to a birthday party. We are not talking about paid rides. Dar uma carona is literally to give a ride. The verb Dar is irregular. In fact, it is very irregular. Many Portuguese learners have trouble conjugating Dar correctly. But you don’t have to struggle! I have a flashcard app for Android devices that will help you practice the present and past tenses of irregular verbs Dar and Fazer. These are extremely useful verbs as they are present in a great number of colloquial expressions. Get the app here. Você vai à festa da Ana, né? Pode me dar uma carona? = You’re going to Ana’s party, right? Can you give me a ride? Eu não dou carona a pessoas que eu não conheço. = I don’t give rides to people that I don’t know. Ontem dei uma carona ao Rodrigo. = Yesterday I gave Rodrigo a ride. The verb Pegar is regular. You just need to pay attention to the extra “u” in the past tense as in examples 2 and 3 below. Carla, posso pegar uma carona com você hoje? = Carla, may I get a ride with you today? Ana: Como você foi pra casa ontem? Rui: Peguei uma carona com o André. Ana: How did you get home yesterday? Rui: I got a ride with André. Não pegue carona com estranhos. É perigoso. = Don’t get a ride with strangers. It’s dangerous. Make an effort to use these phrases in real-life situations so you can commit them to memory. Practice is key to retaining new vocabulary. 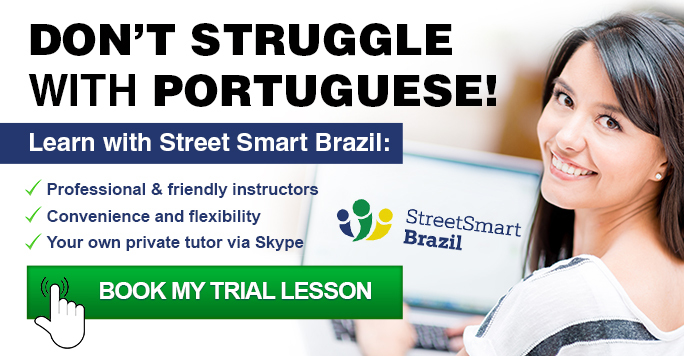 Street Smart Brazil offers one-on-one Portuguese lessons via Skype. It’s a simple, convenient, and effective way to speak Portuguese. Book a Trial Lesson to speak Portuguese that you are proud of!